At approximately 2:50 pm officers responded to a collision that occurred at Eastland Plaza located on Indian Road in the City of Sarnia. 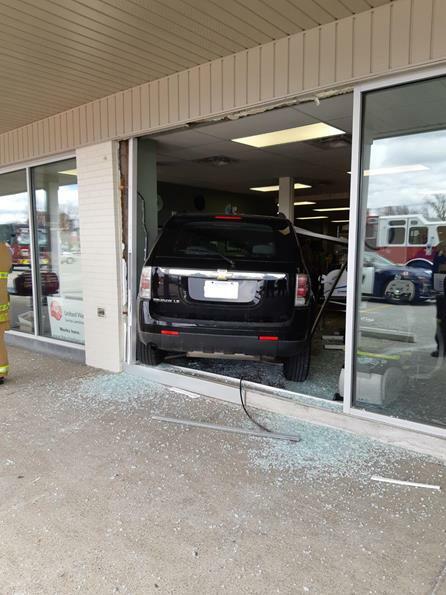 Upon arrival officers observed that a black SUV had driven through the front windows of a business in the plaza and had almost entirely lodged itself into the building. Fortunately the driver did not sustain any injuries but an individual inside the business did sustain some minor injuries that were treated on scene. Due to the fact that the incident did occur on private property no charges can be laid related to the Highway Traffic Act but the investigating officer has made a request to the Ministry of Transportation to have the driver’s ability to drive reviewed.